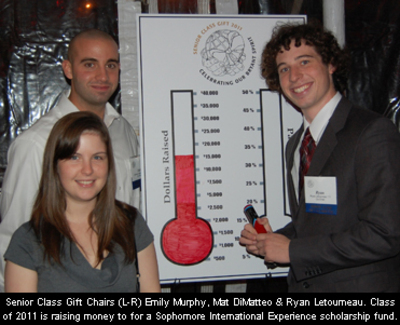 "Class of 2011 Gift -- Sophomore International Experience Scholarship F"
The Class of 2011 senior gift is a scholarship fund to ensure that future students are able to immerse themselves in new cultures through Bryant's Sophomore International Experience. The goal for the Class of 2011 is $40,000 with 50 percent participation. If they surpass that goal and reach $50,000, they will be able to create an endowment, ensuring students have the opportunity to participate in the Sophomore International Experience in perpetuity. More fundraising events are being planned, including Senior Class Gift Day on Tuesday, April 19, 2011. A volleyball tournament will be held from 1-4 pm at the Townhouse volleyball courts, followed by Men's Lacrosse against Yale at 7 pm.